Energy makes change; it does things for us. It moves cars along the road and boats over the water. It bakes a cake in the oven and keeps ice frozen in the freezer. It plays our favorite songs on the radio and lights our homes. Energy makes our bodies grow and allows our minds to think. Scientists define energy as the ability to do work. People have learned how to change energy from one form to another so that we can do work more easily and live more comfortably. Energy is found in different forms, such as light, heat, sound and motion. There are many forms of energy, but they can all be put into two categories: kinetic and potential. Kinetic energy is motion––of waves, electrons, atoms, molecules, substances, and objects. Potential energy is stored energy and the energy of position––gravitational energy. There are several forms of potential energy. Electrical Energy is the movement of electrical charges. Everything is made of tiny particles called atoms. Atoms are made of even smaller particles called electrons, protons, and neutrons. Applying a force can make some of the electrons move. Electrical charges moving through a wire is called electricity. Lightning is another example of electrical energy. Radiant Energy is electromagnetic energy that travels in transverse waves. Radiant energy includes visible light, x-rays, gamma rays and radio waves. Light is one type of radiant energy. Solar energy is an example of radiant energy. Thermal Energy, or heat, is the internal energy in substances––the vibration and movement of the atoms and molecules within substances. Geothermal energy is an example of thermal energy. Motion Energy is the movement of objects and substances from one place to another. Objects and substances move when a force is applied according to Newton’s Laws of Motion. Wind is an example of motion energy. Sound is the movement of energy through substances in longitudinal (compression/rarefaction) waves. Sound is produced when a force causes an object or substance to vibrate––the energy is transferred through the substance in a wave. Chemical Energy is energy stored in the bonds of atoms and molecules. It is the energy that holds these particles together. Biomass, petroleum, natural gas, and propane are examples of stored chemical energy. Stored Mechanical Energy is energy stored in objects by the application of a force. Compressed springs and stretched rubber bands are examples of stored mechanical energy. Nuclear Energy is energy stored in the nucleus of an atom––the energy that holds the nucleus together. The energy can be released when the nuclei are combined or split apart. Nuclear power plants split the nuclei of uranium atoms in a process called fission. The sun combines the nuclei of hydrogen atoms in a process called fusion. Scientists are working on creating fusion energy on earth, so that someday there might be fusion power plants. Gravitational Energy is the energy of position or place. A rock resting at the top of a hill contains gravitational potential energy. Hydropower, such as water in a reservoir behind a dam, is an example of gravitational potential energy. To scientists, conservation of energy is not saving energy. The law of conservation of energy says that energy is neither created nor destroyed. When we use energy, it doesn’t disappear. We change it from one form of energy into another. A car engine burns gasoline, converting the chemical energy in gasoline into mechanical energy. Solar cells change radiant energy into electrical energy. Energy changes form, but the total amount of energy in the universe stays the same. Scientists at the Department of Energy think they have discovered a mysterious new form of energy called "dark energy" that is actually causing the universe to grow! Energy efficiency is the amount of useful energy you get from a system. A perfect, energy-efficient machine would change all the energy put in it into useful work—an impossible dream. Converting one form of energy into another form always involves a loss of usable energy. In fact, most energy transformations are not very efficient. The human body is a good example. Your body is like a machine, and the fuel for your machine is food. Food gives you the energy to move, breathe, and think. But your body isn’t very efficient at converting food into useful work. Your body is less than five percent efficient most of the time. The rest of the energy is lost as heat. You can really feel that heat when you exercise! SOURCE : ENERGY INFORMATION ADMINISTRATION -- DEPARTMENT OF ENERGY -- KIDS HOME PAGE Energy Information Administration, Annual Energy Review 2007, June 2008. The National Energy Education Development Project, Intermediate Energy Infobook, 2007.
c) there are many forms of energy, but they can all be put into two categories: kinetic and potential. 2. 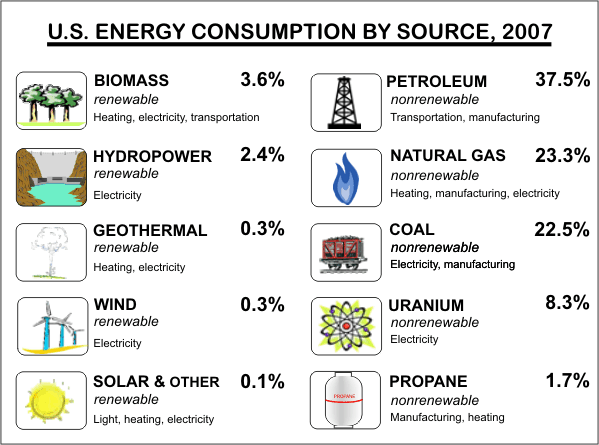 Most energy in the United States comes from nonrewable energy sources. Which nonrenable source uses the greates amount of consumption? 4. A car that burns petroleum is an example of what energy change? a) they are secondary sources of energy. b) are used to store, move, and deliver energy in easily usable form.